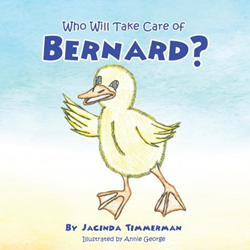 Jacinda Timmerman’s new book, Who Will Take Care of Bernard?, ($9.99, paperback, 9781498455626; $4.99, e-book, 9781498455633) tells a classic theme of God's provision told through an endearing duckling's story. Bernard, a precious little duck with a heart full of love, suddenly finds himself away from his family, in a strange place. He longs for the comforts and safety of home. Afraid and alone, Bernard questions everything. How will this precious little duckling eat, stay warm and learn to fly? The story has an underlying theme of adoption that is very prevalent in Christian circles today. Unfortunately, children – one of the most priceless gifts – are often abandoned, abused or neglected. This book illustrates God's plan for adoption in a way that children can understand, in addition to challenging adults to take up the spirit of adoption and embrace those forgotten by society. Jacinda Timmerman holds degrees in both English and History, including a master’s from SAGU. Though her writing career really began as a child, she has been writing and editing professionally for over eight years. She has also worked as a staff writer/editor and written various creative pieces. Jacinda has witnessed God's provision and faithfulness throughout her life. Xulon Press, a division of Salem Media Group, is the world’s largest Christian self-publisher, with more than 15,000 titles published to date. Retailers may order Who Will Take Care of Bernard? through Ingram Book Company and/or Spring Arbor Book Distributors. The book is available online through xulonpress.com/bookstore, amazon.com, and barnesandnoble.com.